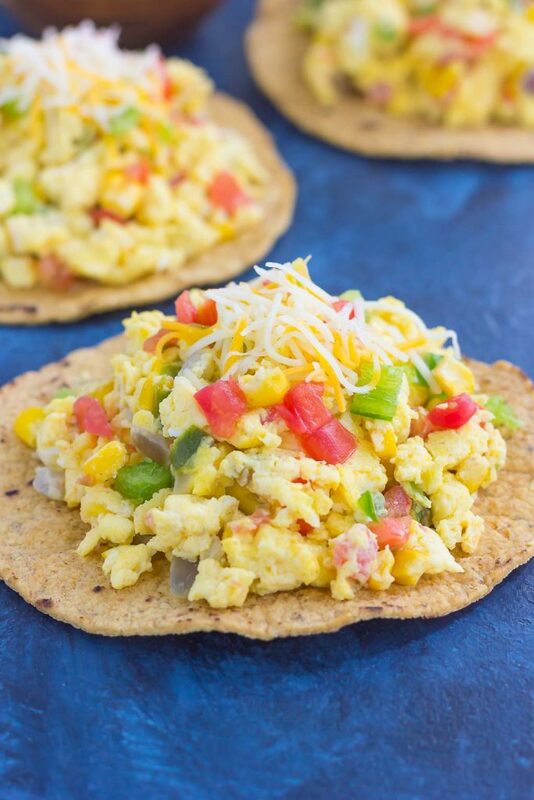 This Southwest Scramble Tostada is simple, 20 minute breakfast that is sure to get your day off to a great start. 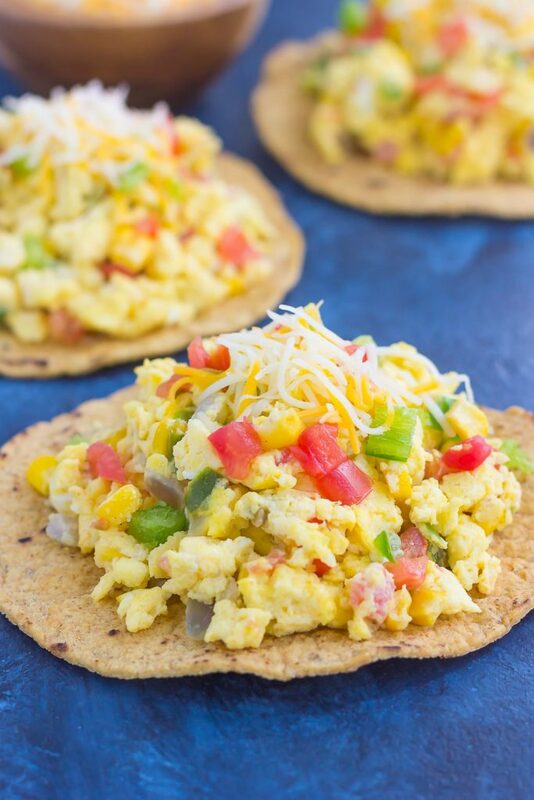 Fluffy scrambled eggs are tossed with green peppers, onion, corn, and tomatoes, and then added to a crunchy tostada shell and sprinkled with cheese. Easy, fresh, and full of flavor, this dish is sure to become a regular in your meal rotation! Have I ever told you that breakfast is my favorite meal of the day? Because it is, it really is. But…I should clarify. I’m talking about ‘the works’ kind of breakfast. You know, the restaurant type meals, where you get eggs, bacon, sausage, toast, pancakes…all that good stuff. Although I love cereal, yogurt, and smoothies for breakfast, it doesn’t rank up there in my ‘favorite meal’ category. But breakfast from a restaurant? Yes, please! Whenever the hubster and I can’t decide where to go for dinner, I always suggest going out for breakfast somewhere, as there are a few Greek diner type restaurants near us that serve breakfast all day. And that always hits the spot! But, I think I’ve found my new favorite kind of breakfast that you can make at home, and still has that restaurant quality appeal! There’s just something about scrambled eggs that keeps me coming back for more. 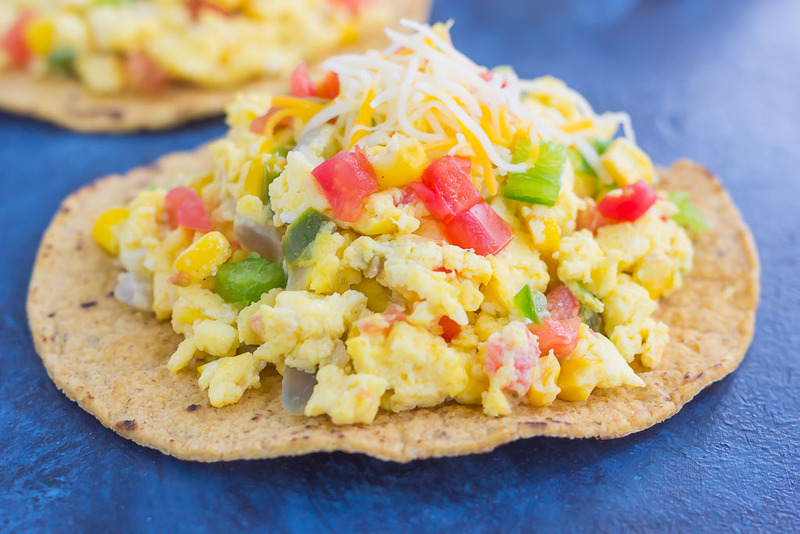 Especially when it’s this Southwest Scramble Tostada. 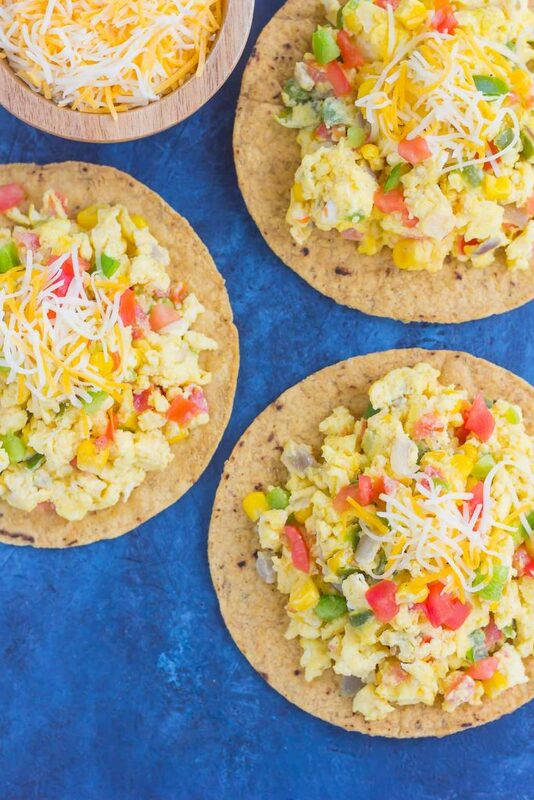 Fluffy eggs tossed with fresh veggies and cheese? Sign me up! 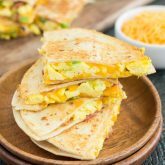 The flavor combination is incredible, and the crunchiness from the tostada puts a unique spin on regular eggs. If you’ve never had your eggs on a tostada before, now is the time to start! And to jazz up these tostadas even more, top the eggs with salsa, sour cream, or cilantro. It’ll really bring out that southwest flair! And the best part about this breakfast is that it’s so easy to customize! Don’t like onions or peppers? Leave it out! Want to add in some black beans? Go ahead. The possibilities are endless! 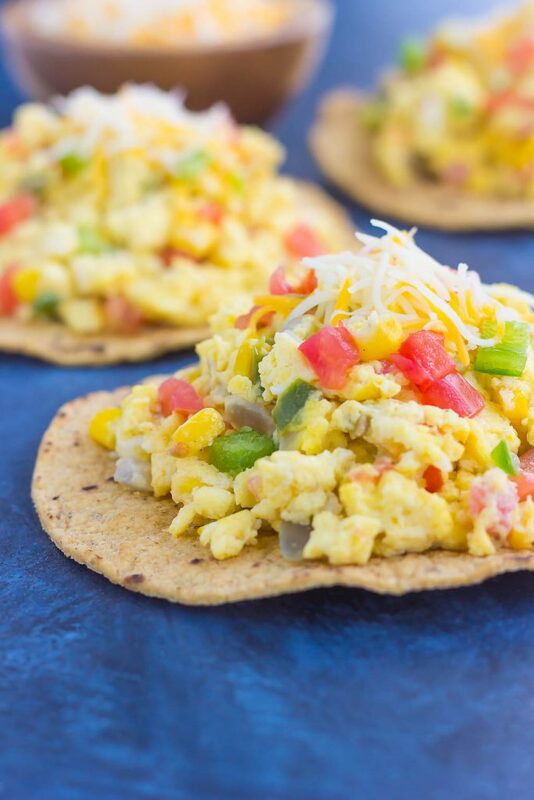 So, if you’re stuck in the same ‘ole breakfast routine, or just want to make your breakfast (or dinner) stand out, this Southwest Scramble Tostada was made for you. Simple to make and even better to eat, you’ll love the zesty flavors and irresistible taste! Add green peppers and onions. Saute for about 2-3 minutes, or until tender. Add corn, diced tomato, salt, and pepper. Stir to combine. 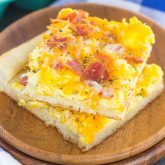 Add eggs and cheese to skillet. Stir until eggs are scrambled and no liquid remains. Serve eggs over tostada shells. Top with additional cheese, salsa, and/or sour cream, if desired. I do love a full on breakfast and usually only have something like that on the weekend. I actually go to bed and look forward to waking up to eat, lol :D This tostada looks so good, Gayle and love the textures going on. It's lots to it, but also healthy too, which I love. Plus, like you said, it's customizable so that's always a good thing :) Bet this would be lovely if friends were over and there was a breakfast bar with all kinds of toppings that people could pick from. Pinned, of course. Hope you have a fantastic week! Yes! It's always nice to look forward to breakfast the next day! Thanks so much for the tostada love and pin, friend! Breakfast is 100% my favorite meal of the day. I want this tostada scramble tomorrow morning!!! This is one gorgeous loaded tostada, Gayle! I LOVE that you made it Southwest-style! This is definitely the kind of Monday food I need. I wish we had real diners around here...they were the BEST for those times when you can't decide on anything. I'm all about savory in the mornings, and these tostadas look right up my alley! Thanks, Alyssa! I love savory breakfasts, too! I LOVE the looks of this! Breakfast is definitely my favorite meal of the day, too -- so good I could eat it for every meal, any time of the day! This would make such a great easy, healthy summer lunch! Me too! I would happy if I had breakfast all day, every day. Thanks, Ashley! Thanks for the tostada love, Mira! Thanks so much for the sweet comment, Cara! I love breakfast food any time of day and I'm wondering why I've never thought to make a breakfast tostada? 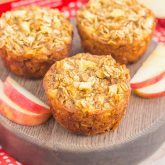 These look so delicious and would be perfect for weekend brunch or even dinner! Thank you, Marcie! 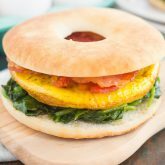 This would make a great brunch or dinner! Breakfast is totally our favorite meal! Wish we had these tostadas for breakfast this morning. They look SO delicious and sound perfect for lunch and dinner too! Thanks, Kelly! This is my new breakfast favorite! This is a meal for morning noon and night in our house! I love savory egg dishes! Delicious, my friend! Pinned! I love breakfast food too, I feel like I could eat it for every meal and be happy! These tostadas look so delicious and I love how easy they are too! Thanks, Danielle! Easy breakfasts are the best! I love breakfast food - I could definitely eat it for every meal. I do often it for dinner, too! These tostadas look perfect and right up my alley! Love how easy these are, Gayle! Breakfast food is the best! Thanks, Keri! Why have I never put breakfast goodness on a tostada before??? These look so good! I hope you had a great 4th Gayle!! Yay for breakfast all day! Thanks, friend! What a great breakfast for dinner idea!! !